Welcome our contributing writer Constantine vonHoffman of "Collateral Damage" - "Today's sarcasm is tomorrow's news". 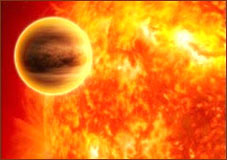 Constantine is sometime journalist, alleged humorist, award-winning science fiction writer and social media maven for Spoke.com. 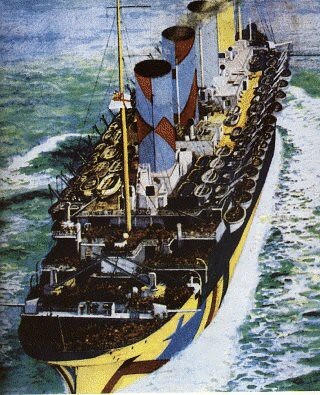 Naval fleets once were the largest painting canvases in the world. War has inspired many great artistic moments but how often have artists returned the favor? Once, as far as I can tell. 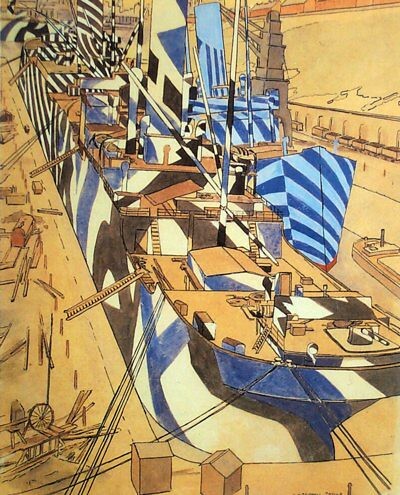 During World War I Modernism descended on Allied naval planners with a bang (sorry about that), turning fleets into the largest painting canvases in the world. Like most of us, The Allies only turned to modern art out of desperation. German U-boats were sinking enormous amounts of shipping and there was no really effective defense against them. It is axiomatic that if you can't stop the people who are shooting at you, you should make it very hard for them to find you. Thus, camouflage. Most camouflage is based on the idea of concealment and blending in with its surroundings. However another school of thought has argued for making the item in question appear to be a mashup of unrelated components. 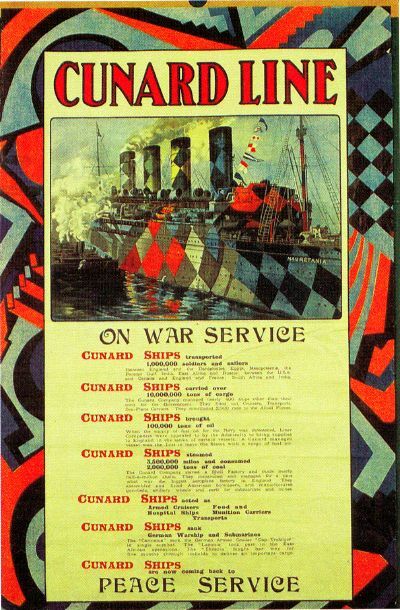 Naval camoufleurs found this theory particularly appealing. 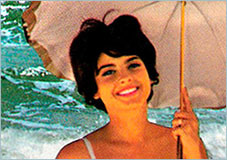 Blending didn't work because ships operated in two different and constantly changing color environments – sea and sky. 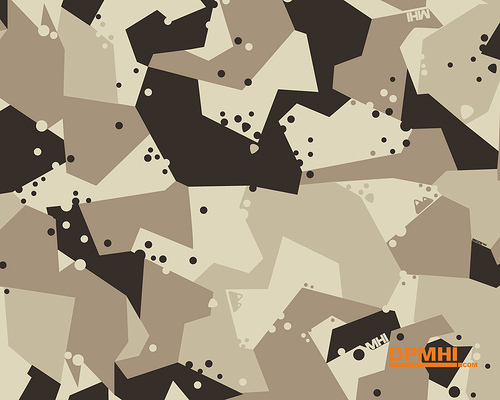 Any camo that concealed in one environment was usually spectacularly conspicuous in others. 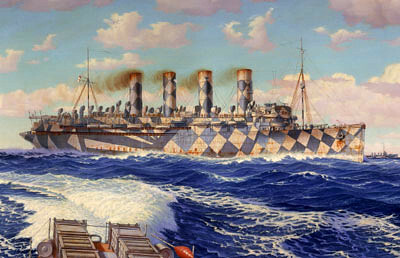 Norman Wilkinson, a British naval officer and painter, suggested a scheme that came to be known as Dazzle or Razzle Dazzle painting. 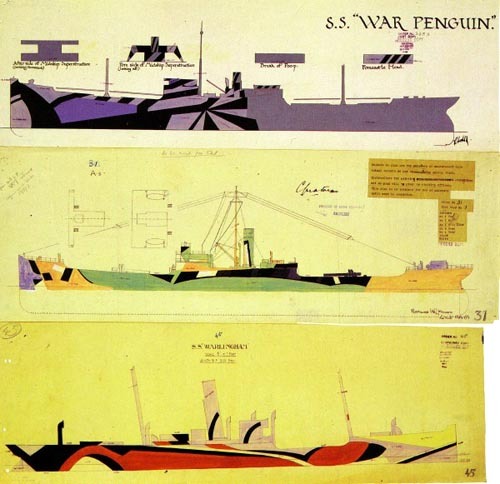 Wilkinson believed that breaking up a ship's silhouette with brightly contrasting geometric designs would make it harder for U-boat captains to determine the ship's course. How well did it work? How well do most artistic theories work when they confront the real world? While there was a marked decrease in losses to U-boats après Dazzle, historians agree that this reduction was mainly due to the adoption of the convoy system at the same time. 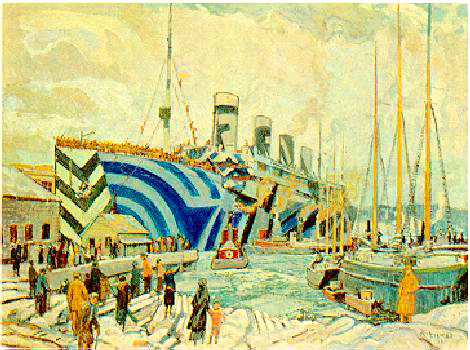 Dazzle did, however, boost the morale of allied seamen as well as capture the imagination of artists and the public alike. Had the Allies been fighting art history majors or Academy painters there is little doubt they would have been stunned into submission by the sheer audacity of the color schemes. The only way these designs would have confused the U-boat captains was if the sky and sea had been created by Mondrian or Duchamp. 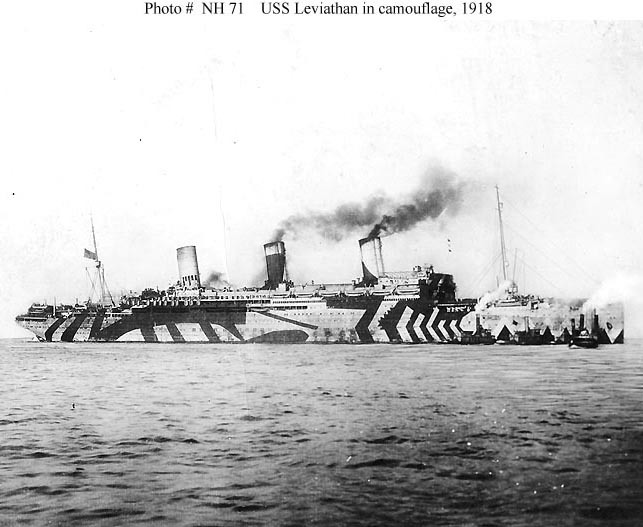 While full color Razzle Dazzle never really succeeded, its easy to see its impact in later successful camouflage. 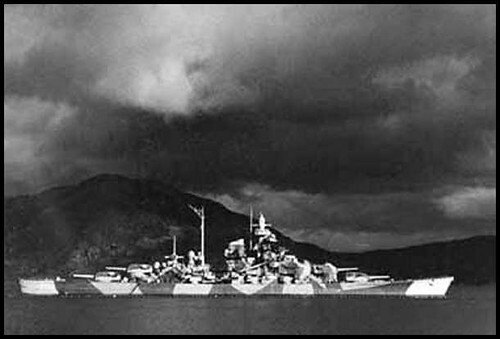 The German Navy tossed out the garish color schemes and used geometric painting in black, white and gray during World War II. Other navies continue to use variations on this to this day. Unfortunately there are no known color photographs of these ships. 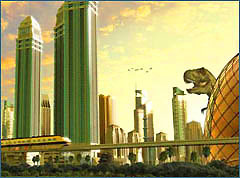 Contemporary accounts describe them as every bit as breath-taking as one would imagine them to be. 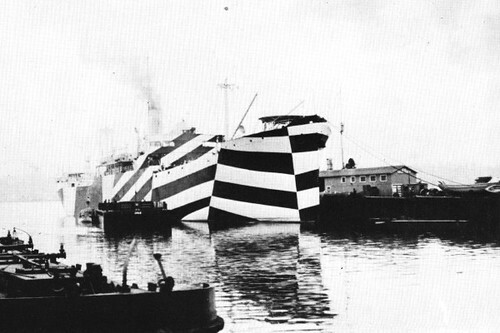 It is fitting that the best representations we have of the Razzle Dazzle ships are done by painters. 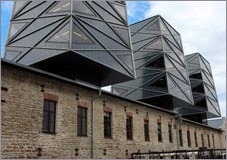 Dazzle has also had significant impact throughout the world of art. 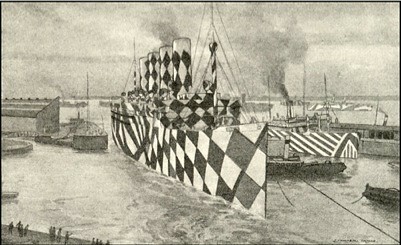 Military historians have usually connected Razzle Dazzle with cubism, which is patently wrong. It is quite clearly inspired by Vorticism, which is considered to be the only significant British art movement of the early 20th century. 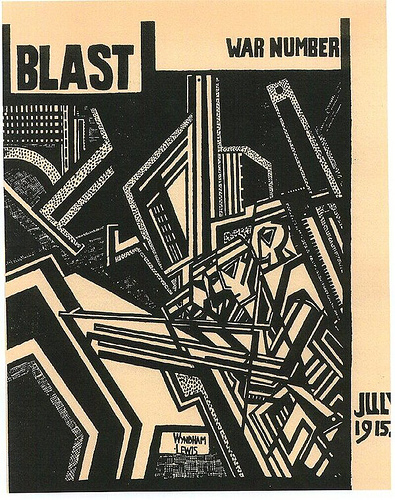 Started by Wyndham Lewis, editor of the short-lived "Blast" magazine, Vorticism was much more confrontational than Cubism. The Cubist was concerned with apples, guitars and life in the cafe. The Vorticist was not afraid of looking outside the cafe and observing the architecture which surrounded the cafe. 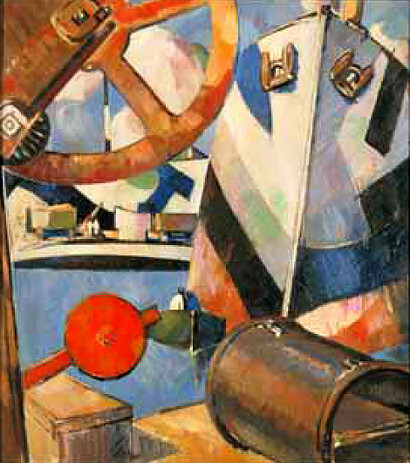 Also, there was a hint of aggression, or conflict in most Vorticist works that is entirely missing in French work. 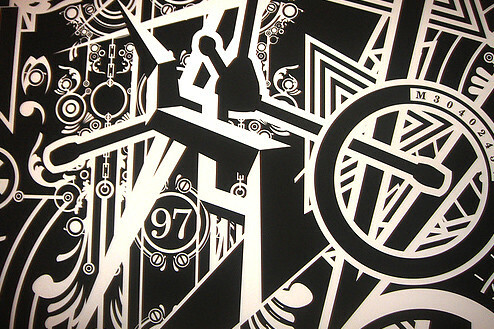 Vorticist works are characterised by the unease created by a disrupted perspective. (more info here) Given that description which artistic theory would you rather use to cover your ship? This was not the oddest attempt to disguise ships. That honor goes to another Brit: Lord Mountbatten. 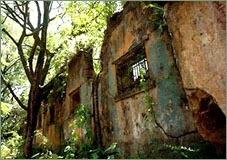 In 1940 then Capt. Mountbatten was in charge of a convoy of ships. He noticed that one ship in the group disappeared from view earlier that the other ships. 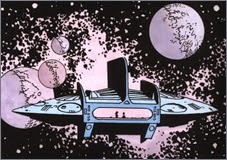 That ship was a Union Castle liner that was still wearing her pre-war hull color of medium lavender mauve grey. 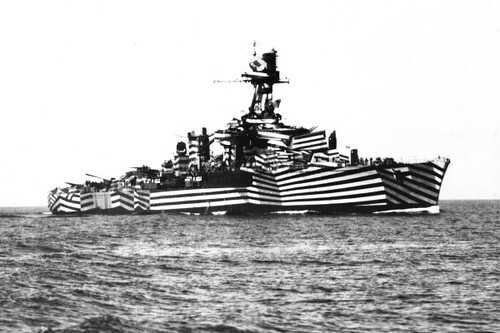 A special kind of camouflage was employed by the Dutch warship Abraham Crijnssen. 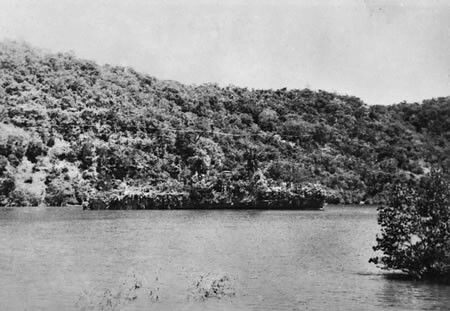 Originally built in 1936 as a minesweeper, this ship was stationed in the former Dutch East Indies in 1937. 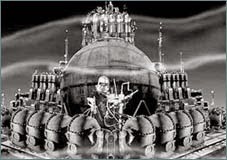 At the outbreak of the Second World War "Abraham Crijnssen" made its escape from the Japanese invading forces in a truly spectacular way. Australia. 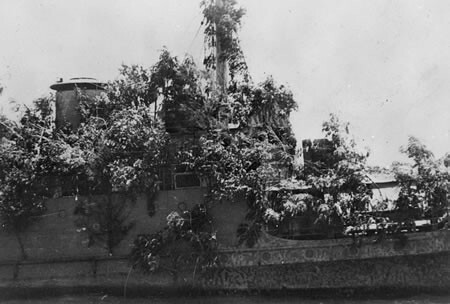 From there the "Abraham Crijnssen" undertook patrol and convoy services until the end of the war. 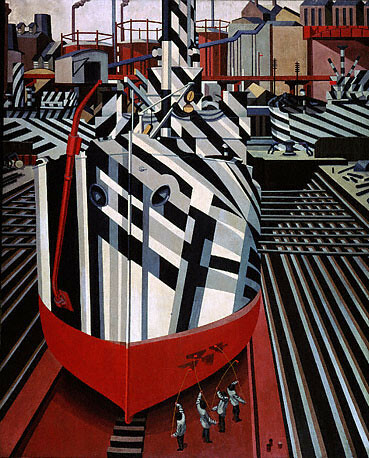 REQUIRED READING: "The Great War and Modern Memory" by Paul Fussel. 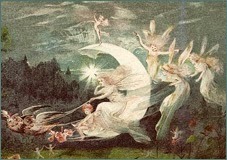 The pre-eminent study of World War I and it's impact on the world's artistic vision. Superb. Article by Constantine vonHoffman of "Collateral Damage" and Avi Abrams for Dark Roasted Blend. As fas as I am concerned, camouflage is applied to equipments in order to avoid being noticed. The British army used pink for desert patrol vehicles during the Second World War and continued to do so for some time after. Not just slightly pink, either, but /very/ pink. They were known as Pink Panthers. 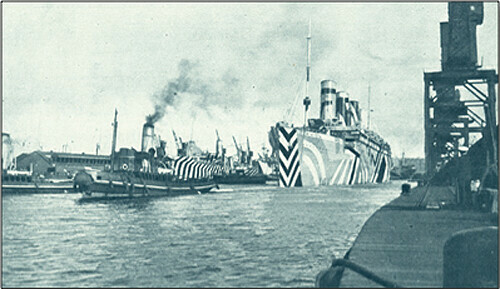 One of the primary objectives of dazzle camouflage was to prevent effective use of optical rangefinders. 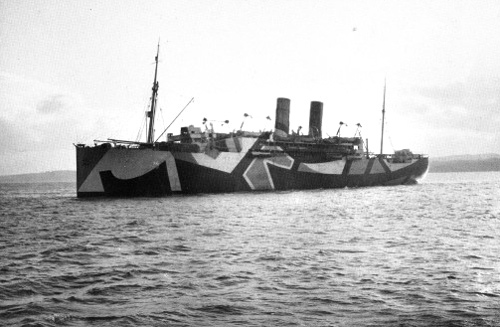 It was also important to confuse observers as to course and speed so many camo schemes incorporated false bow waves or false bow and stern outlines. As an aside, sometimes camouflage can be too good. 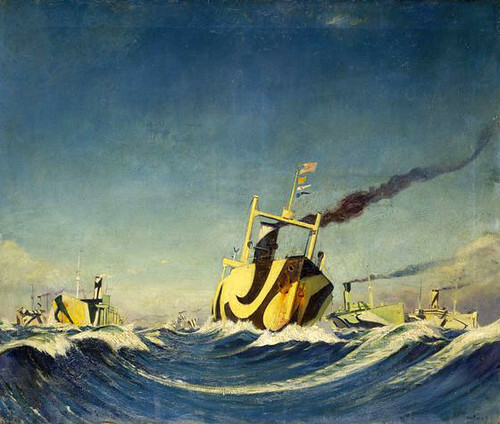 The multi color scheme developed for the Denny Steam Gunboats in WWII was so good that two gunboats ran into each other while on patrol because neither one saw the other. Pink is a popular color in the military. 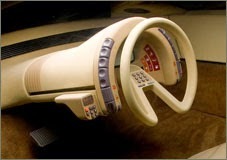 Robyn Miller, co-creator of the game Myst, has a truly wonderful article on other pink military vehicles here. I need to repaint my bedroom, and Medium Lavender Mauve Grey looks just the ticket. Hurrah for battleships. 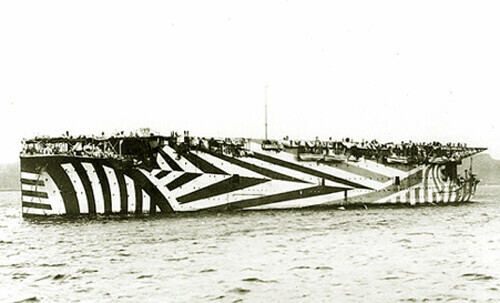 Bedrooms aside, dazzle camouflage actually turns out to have been pretty effective, as slow joe crow points out. It was meant to confuse rather than conceal, and did its job very well. (After all - we did *win*.) Many of those patterns created one or more fake bows, which confused submarine periscopes trying to aim for the ship's weakest spot. I do wonder whether the general designs chosen would have been different if the prevailing artistic movement at the time hadn't been modernism (and if you look at paintings by people like Bawden and Ravilious you can absolutely see where those boldly hatched patterns came from aesthetically). thanks for all that info... pink is the best camouflage in the desert. Goes well with tanks, too. FAKE, just a photoshop geek gone wild. Just kidding, somebody had to say it. Dutch graffiti artist 'Delta Inc' has produced a Dazzle Be@rbrick for the Kubrick toy range. 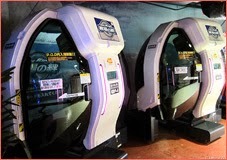 They will definitely have a hard time being hit by torpedoes. 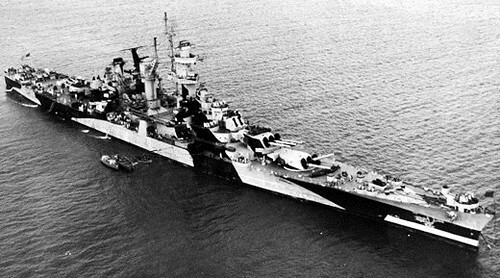 BTW, we have received some emails pointing out that we misidentified the HMS Argus as the HMS Sargus. I'm sticking to my theory that this, too, was part of the camo. 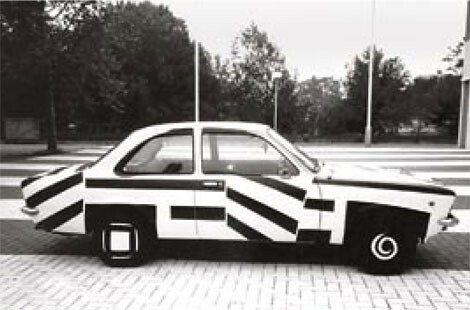 WELL , I THINK THAT THE CAR WITH THE DAZZLE PAINTWORK IS AN OPEL KADETT , NOT A FIAT STRADA . opel kadett , transforming it into a fiat strada !!! Avi, the picture caption that reads 'The HMS "Sargus"' should say 'HmS Argus'. HMS, standing for His (or Her) Majesty's Ship, does not have 'the' in front of it. Is this the best camouflage in the world? I think so! actually popular usage has made "HMS So So" totally acceptable. I always thought that dazzleflage was pretty cool to look at and something that might serve a useful purpose today. Watching a program on sharks a while back some scientists conducted an experiment where they tossed two pieces of wood, one shaped like a seal and one a square. Naturally the shark attacked the seal shape but pretty much ignored the square because it didn't look natural. Imagine if you were to do a dazzle pattern on a wetsuit and/or the bottom of a surfboard and actually make it visible when viewed from below I wonder if it would help to prevent surfers and snorklers from being mistaken for seals by sharks since their outlines would be completely broken up and look completely unnatural to a hungry shark. Well, sharks also have alternative ways to hunt you down. Not that it wouldn't still help. I don;t think you did all your homework on this one. 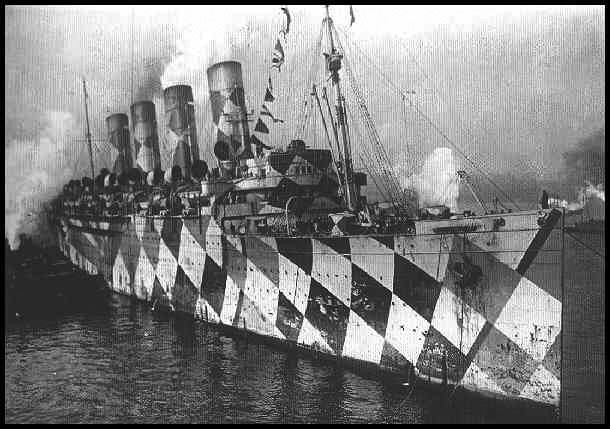 The British Admiraly studied Dazzle painting after WW1 and was unable to find one incident in which is helped throw off a U boat torp. Thus they declared it a failure. However, it had an interesting secondary impact in that it provided a major morale boost to the sailors on the ship (thinking they were safer). Thus they kept doing it for that reason alone. So, no. The official Royal Navy report says that it was NOT effective. Not entirely true, Jon. The Brits couldn’t prove it worked, but they found it didn’t make the vessels more of a target, either, so as it didn’t do any harm, and could be said to be a morale booster, as you mention, it was kept. Proving its effectiveness was always going to be difficult though – the idea was to prevent or delay an attack in the first place, not throw the submarine’s aim off. Since a vessel would have had no idea it was being targeted until it saw torpedo tracks in the water, the Admiralty could only measure reports of actual attacks, not attempts. 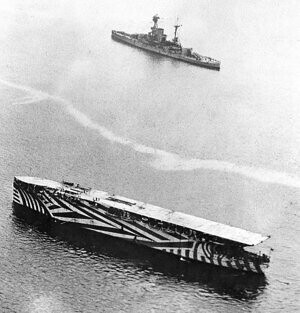 Conversely, the US Navy decided Dazzle WAS effective! Gosh this is so Fernand Leger! Haha. I'm stunned. An additional comment. 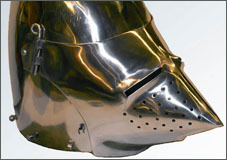 Warfare did not originally mean concealment. Both land and naval forces clearly announced their presence before battle by flags and banners. Only after trench warfare became the order of the day, did camouflage become standard. Compare any Civil War Movie with any WWII movie. One has armies marching in formation towards each other, the other has small groups sneaking up on each other. Different uniforms for different tactics. Ditto for Naval forces. Zouave units were formed in honor of Algerian infantry which had covered itself with glory. There were many Zouave units in the Civil War on both sides. They were considered elite units, much like paratroop or special forces,wearing berets rather than helmets. When weapons became long range so warfare was no longer face to face, camouflage became important. 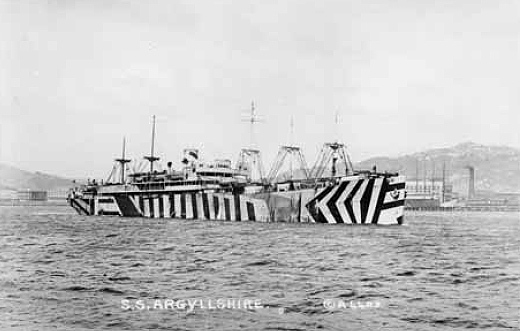 As mentioned, the dazzle pattern also confused range finding, there was no radar or sonar, only optical range finders. So correct focus was very important, but the dazzle made it difficult to focus correctly making accurate range estimates impossible. By WWII, 16 inch naval guns had a range of 25 miles. 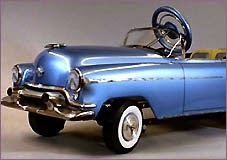 The visual horizon is 6 to 12 miles, depending on how high above sea level you are.